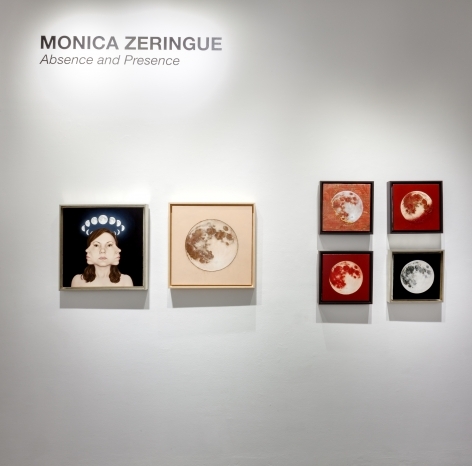 JONATHAN FERRARA GALLERY is proud to announce Absence and Presence, new drawings and paintings by artist MONICA ZERINGUE. The exhibition will be on view in the centre gallery from 1 through 31 October 2015 with an opening reception on Saturday, 3 October from 6-9pm in conjunction with Art For Arts’ Sake, a city-wide kick-off to the Art Season in New Orleans. For her second solo-exhibition at the gallery, the artist continues her “Goddesses and Monsters” series while honing in on lunar iconography. 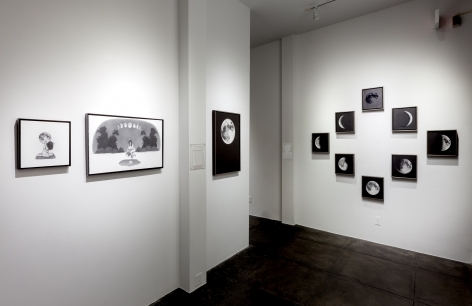 Known for her self-reflexive and mythical drawings, Zeringue shifts her concentration from the female figure and turns to the phases and form of the moon and its cultural associations, prevalent in society tracing back to ancient divination, religion, language, calendaring, and art. Zeringue says of her new work . 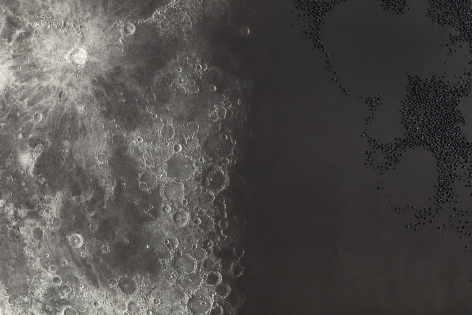 . .
My use of the moon as a subject in my new work began as an extension of the mythology-based images of my most recent work. Rather than using the image as part of a larger allegory, I decided to use color and texture to explore the mystical and cultural connections we have to this heavenly body. 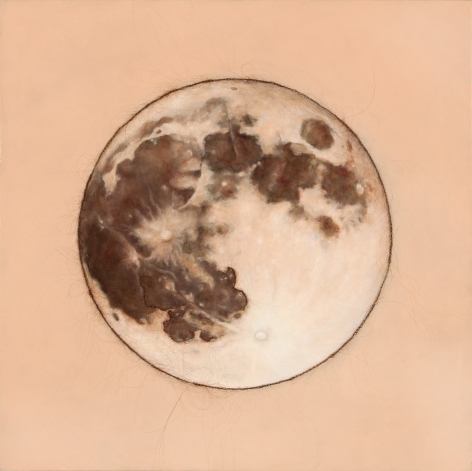 In the oil paintings, the Blood Moons and Flesh Moon, I wanted to make the connection between the moon and the body, the moon and the feminine. 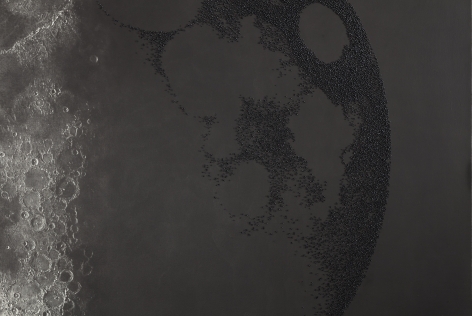 The surface of the moon is rendered to look like flesh, pink and wet, with craters that look like wounds and birthmarks, and hair sewn onto the surface. 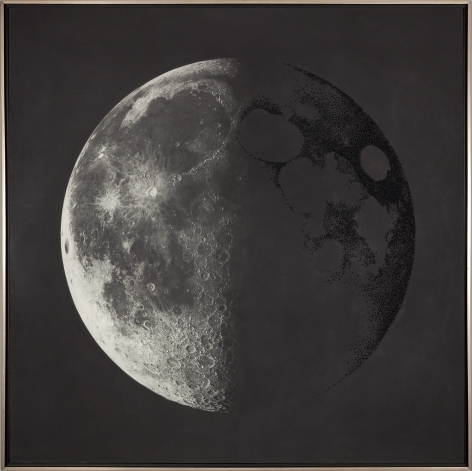 My exploration of these references continues in the moon cycle series, rendered in graphite on primed linen, I chose 8 phases to represent the full lunar month. 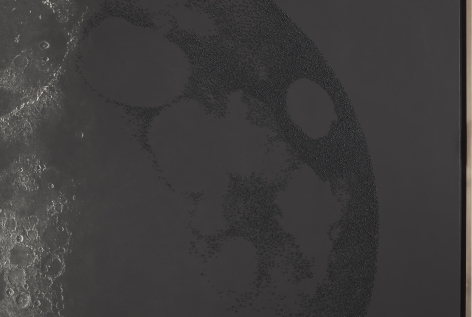 The moon grows, diminishes, dies, and then is reborn. Here, my interest lies in how that repeating pattern relates to the cycles in our own lives— in the grand scale of human history, in an individual’s life and death, and especially in the small endings and beginnings in everyday life. 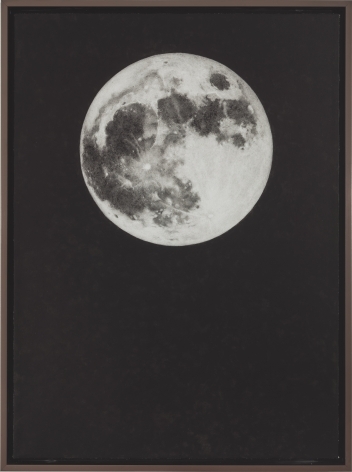 Hope and anticipation can be found in the young, growing moon, and loss, longing and fear as the moon wanes. I am particularly interested how endings bring about new beginnings. 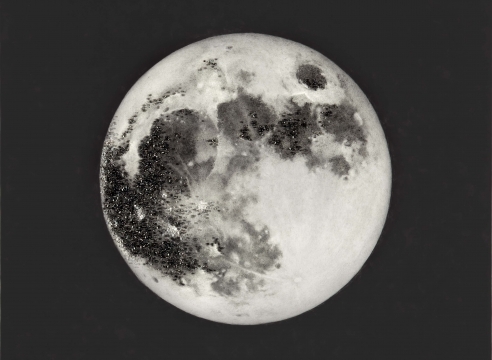 The dark moon is called a new moon, so the completion of the cycle is really a birth. In each individual moon I finish with hand-sewn beads to play with the tension between the light and shadow. 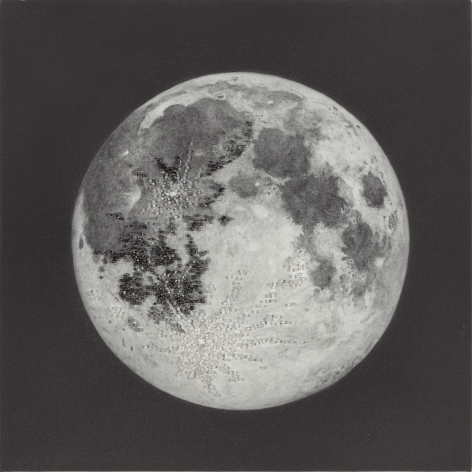 Shiny beads reflect light back to the viewer, much like the moon, whose glow is dependent on an outside source. 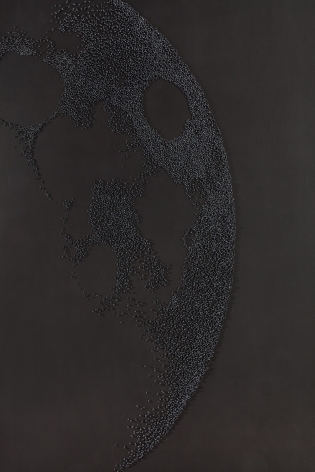 Dark, light-absorbing matte beads define craters and shapes on the shadowed side in an almost obsessive attempt to remember and recreate what is lost. Positive and negative spaces are given equal attention, as is the border between the two. Absence and presence. Both are vital to the mystical nature of the moon. 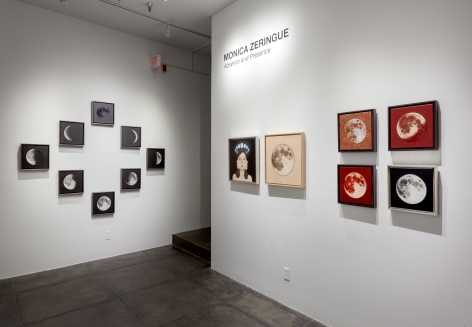 Monica Zeringue received her MFA from the University of New Orleans in 2006, and her BA in 1993. In 1999 she was awarded the Prix de l'Acadamie de Paris, Societe Internationale des Beaux-Arts. She has exhibited her work at the Meadows Museum of Art, Contemporary Arts Center New Orleans, Dishman Art Museum and the Lauren Rogers Museum of Art, and numerous gallery solo exhibitions in New Orleans since 1999. 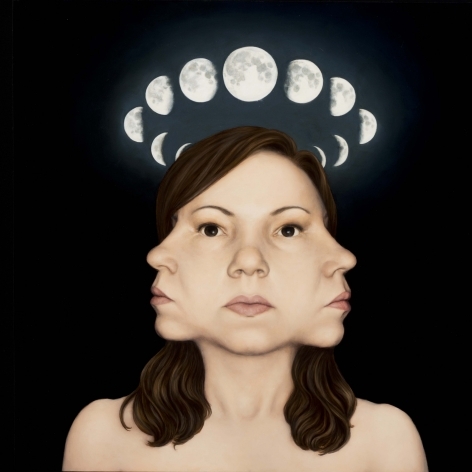 Her artwork was featured in the New American Paintings 2011 and 2013. 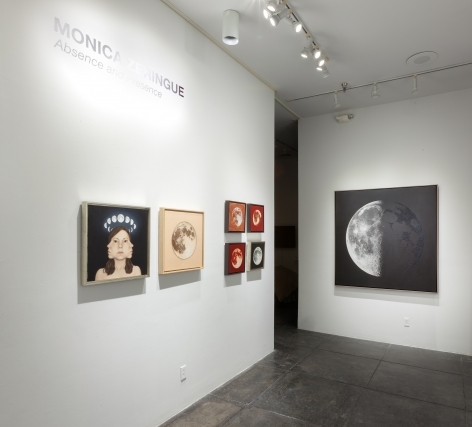 Her work has been exhibited at various art fairs including Texas Contemporary, Miami Project art fair for Art Basel Miami Beach, and VOLTA 10 in Basel, Switzerland. Most recently, Zeringue was one of only 25 artists nationwide to recieve of the Joan Mitchell Foundation’s Painter and Sculptor Grant. Zeringue's work is included in various public and private collections worldwide, including the New Orleans Museum of Art, The Diane and Sandy Besser collection, Frederick R Weisman Art Foundation Collection, Los Angeles, CA, the Alexandria Museum of Art, Alexandria, LA, the Arts Council of New Orleans, Collection of Thomas and Dathel Coleman, New Orleans, and Collection of Donna and Ben Rosen, New York. 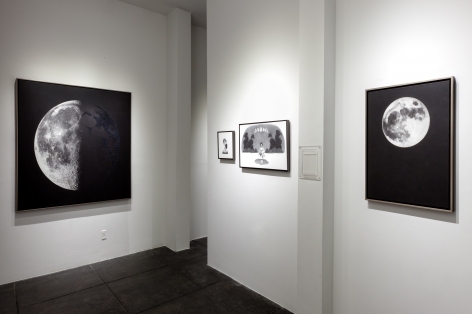 Zeringue lives and works in New Orleans, LA and is represented by Jonathan Ferrara Gallery.